The governor, the mayor and representatives of Amazon and public agencies announce the LIC deal. Unless you’ve been stuck under a rock – or perhaps on the 7 train – you’ve heard the news: the winner of the Amazon HQ2 sweepstakes is…Amazon. Two hundred and thirty-eight cities competed. Twenty finalists raced to the finish line. Two – New York City and Washington, D.C. – were selected to split Amazon’s new so-called second headquarters. But in the end, Amazon took home the big prize: $4.6 billion of public money. New York assembled an unprecedented package of subsidies to lure one of the world’s biggest corporations, headed by the world’s wealthiest human, Jeff Bezos, to Queens. The negotiations took place behind closed doors, without a single public hearing and little, if any, community engagement. To prevent possible delays or second-guessing of the deal, the Mayor agreed to bypass the City Council and the city’s public land use process. And it just so happens that Amazon’s Long Island City location will be sited in one of Trump’s new “opportunity zones,” offering up lucrative tax breaks to wealthy investors and further enticing development that will likely exacerbate gentrification. Did we mention the helipad? In a rare kumbaya moment, Governor Cuomo and Mayor de Blasio came together earlier this month to celebrate Amazon’s planned Queens campus. Local residents, electeds, and community and labor groups, meanwhile, have voiced vehement opposition to the plan, and a coalition has quickly come together to try to block its implementation. Opponents foresee further strain on the city’s already beleaguered transit system and infrastructure; accelerated gentrification and displacement in Long Island City and northwest Queens; and yet another corporate welfare deal – reportedly the largest in New York’s history – benefiting a company with an abysmal record on labor and the environment, no less. So, what would an equitable economic development agenda for New York look like? For starters, we need to dramatically change the frame on development. Instead of handing billions in public subsidies to Amazon and other mega-corporations, New York should invest in cooperative, bottom-up economic development led by and directly benefiting people and communities of color, immigrants, and women – who are disproportionately harmed by our current unfair, extractive economy. New York is perfectly positioned to grow its cooperative economy, and in fact has taken initial steps to do so. The number of worker-owned businesses in the city has tripled since 2014, thanks in part to critical, multi-year funding from the City Council. Worker co-ops like Sunset Park’s Sí Se Puede and the Bronx’s Cooperative Home Care Associates provide thousands of jobs with dignity to immigrants and women of color who make up the majority of worker-owners here. And in Albany, Sen. Jamaal T. Bailey, who represents parts of the Northeast and Northwest Bronx and the City of Mount Vernon, has introduced legislationto create a state-run employee ownership center, providing technical assistance and other support to businesses that are converting to worker ownership. Community land trusts – like New York City’s Cooper Square and East Harlem/El Barrio CLTs and Buffalo’s Fruit Belt CLT – are likewise gaining traction as a proven strategy to curb speculation and ensure permanently affordable housing and serve other community needs. New York City passed enabling CLT legislation last year, and the NYS Attorney General’s office recently helped direct bank settlement funds to CLT efforts around the state. A crucial next step should be for city and state agencies to prioritize CLTs and permanently affordable housing, when awarding public land and other subsidies. Community development financial institutions (CDFIs) represent another opportunity for New York to jumpstart economic growth at the grassroots. In historically-redlined neighborhoods throughout the state, loan funds and financial co-ops – like The Working Worldand Lower East Side People’s Federal Credit Union– are meeting critical needs, channeling more than $2 billion in low-cost financing annually to support New York’s small and worker-owned businesses, limited-equity housing co-ops, community centers, and more. 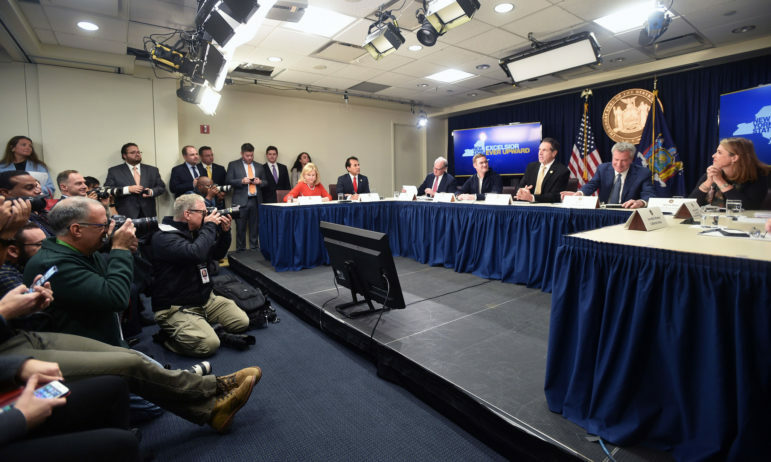 That’s why more than 60 organizations statewide last year called for a modest $25 million budget allocation to support CDFIs – tantamount to a rounding error in the state budget and .01 percent of what New York has offered Amazon. The governor and state legislature should deliver on funding for CDFIs this legislative session. A comprehensive equity agenda starts with a bold vision. It calls for policies and actions that transform, rather than perpetuate, our fundamentally unjust social, political and economic systems. It means putting racial and economic justice front and center. It requires decision-making led by people and communities typically left out of, and harmed by, status quo economic development. And it demands that our elected officials do much more to tackle our most existential crises – from climate devastation to persistent wealth inequality. In the face of federal attacks on immigrants, women and people of color, the need for bold, local action has never been greater. Unlike Amazon, grassroots and nonprofit initiatives advancing equitable development actually need public support. Imagine what a even slice of the billions promised to Amazon would do to expand worker, food, and financial coops; channel land to CLTs; expand community-controlled renewable energy; create an office to support cooperative economics in every city; or even capitalize municipal public banks to bolster equitable economic development initiatives and free municipalities from Wall Street predation. Wouldn’t it be nice if the governor and mayor teamed up for that? Deyanira Del Rio is co-director and Andy Morrison is campaigns director of New Economy Project, which works with community groups and low-income New Yorkers to build an economy that works for all.